In many households the kitchen is the center of the home—and more and more, the natural gathering place in the kitchen is around the island. 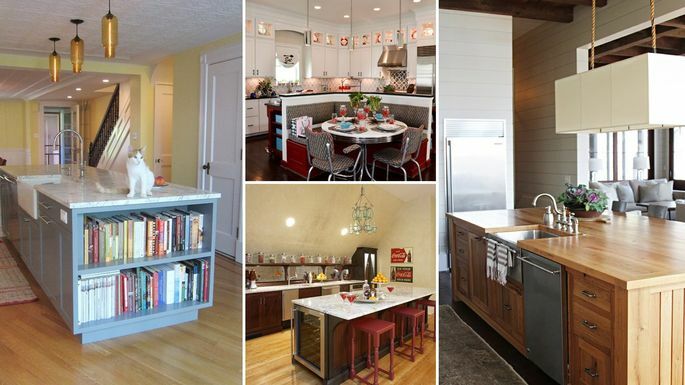 Kitchen island ideas can show you that these useful features come in a variety of sizes and materials to accommodate your floor plan, but they all provide storage and a useful surface alternative to your counters. To understand an island’s true value, you’ll need to understand just how many purposes this awesome amenity can be used for. If you love to cook and regularly host Thanksgiving, the prospect of four more burners is exciting. You can also put a grill or griddle option on the island and use the main stove’s burners for regular pots and pans. But if you have little ones around you might want to think twice before installing a cooktop burner. “If there are small children in the house, you’ll lessen the chance of burns and other accidents by putting the cooktop along the perimeter of the kitchen, rather than on an island,” explain Melissa Fenigstein and Linda Pravata, designers with New Age Interiors, in Syosset, NY. 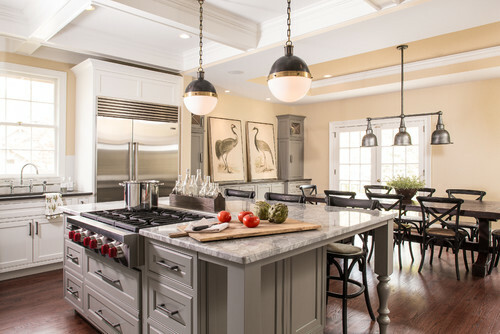 Photo by Renewal Design-Build – A cooktop island will revolutionize your Thanksgiving cooking. Installing a kitchen island with a wine refrigerator will net you extra storage in your main refrigerator, a temperature-controlled environment for your most prized bottles, and extra seating for your guests. If you enjoy hosting wine tastings, this style works well. But be sure to consider the height of the mini bar top and how much food prep you’ll end up doing here. A counter-level kitchen island will display any mess you make. If you plan to chop and dice, consider a two-level version, with the lower portion on the prep side and the higher portion on the seating side, suggests Fenigstein. Photo by Lilija Gelazis AIA – Is your house the designated dinner party destination each weekend? 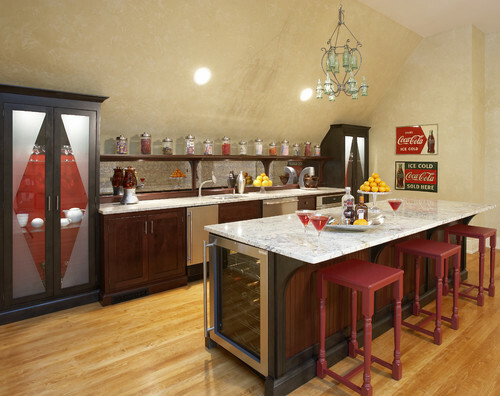 Consider a kitchen island with a wine fridge. An extra sink for washing lettuce and filling the kettle makes this a worthy kitchen addition. 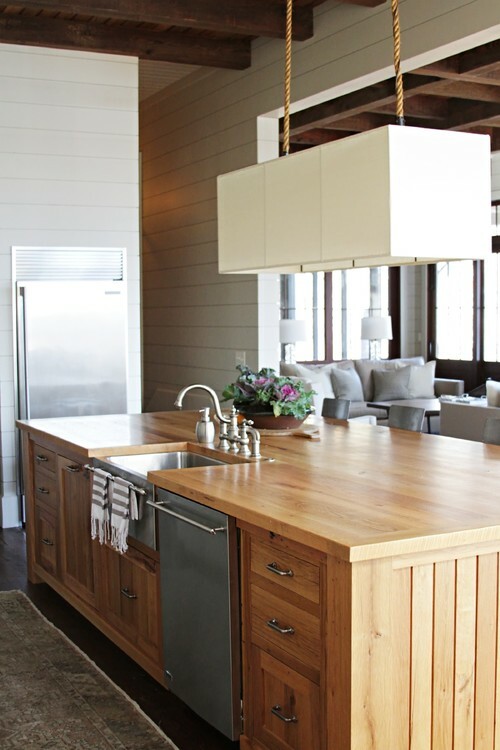 You can also customize the surface to include a cut-resistant wood countertop or a marble counter to roll out pastry. “There’s always someone who needs to wash their hands while the main sink is occupied,” Pravata notes. You’ll also lose storage underneath the sink because the plumbing has to be accommodated. Photo by Yvonne McFadden LLC – Meal prep is a breeze with an extra sink and space to chop. 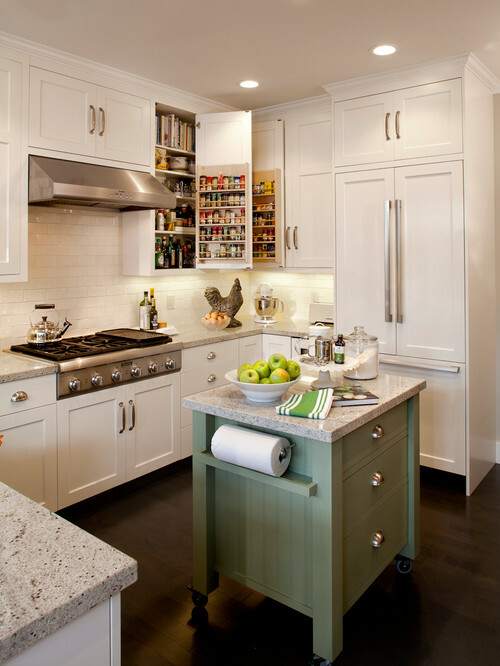 Who doesn’t want more storage, especially in the kitchen? Shelves for cookbooks, a wine rack, a bin for firewood, or glass-front cabinets for serving dishes are all possibilities with a storage island. The drawback: These cabinets are low to the ground and require some deep knee-bends to put things away. “The lighting in these spaces isn’t great, so you might have to install cabinet or drawer lights to see what’s inside,” notes Novak. Photo by Neuhaus Design Architecture, P.C. 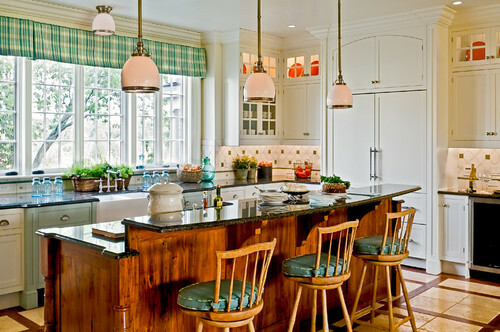 – Keep cookbooks, pots, and extra dishes where they belong: beneath your kitchen island. We all know the family dog really rules the house, so why not give Hootch his own area in the center of the action? 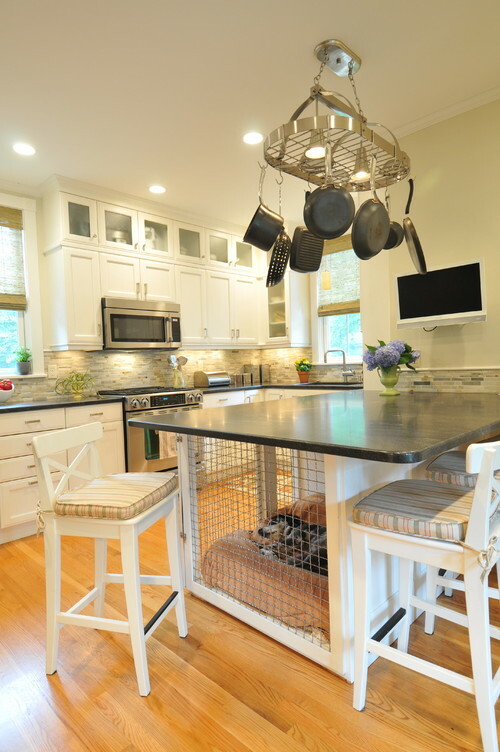 A built-in crate can have a spot for water and food bowls, dedicated hooks for the leash, and a drawer for his toys and shampoo. Keep in mind, though, that it needs to be kept pristine. “Stray pet food can attract insects, and animal fur flies all over,” says Novak. Dog beds can stink up the place, and some pets might just drool and beg for food all day if their main hangout is in the kitchen. Bottom line: Know thy pet. 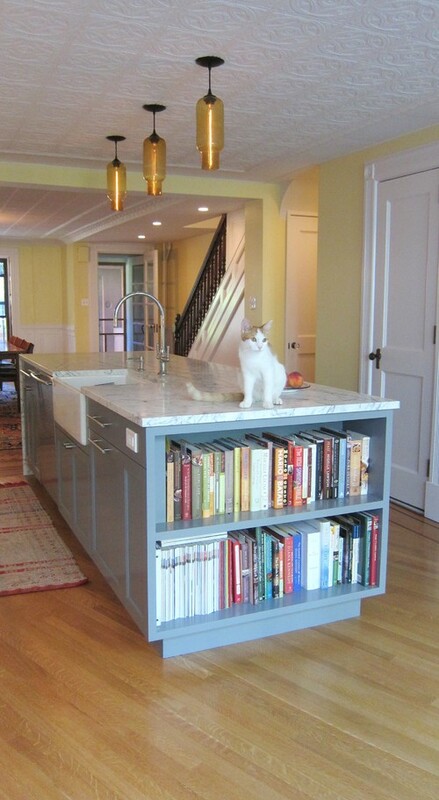 Photo by Betsy Bassett Interiors – Give pets a comfy place to hang out in the most popular part of the house. A two-level island with stools provides your tweens an area to finish their algebra homework while you whip up dinner. The downside? Clutter. “You’ve got to stay on top of the paper piles or it’ll end up looking like a huge mess,” points out Novak. Find a place to stash notebooks, pens, and paper, or adopt a system to keep homework supplies organized. Photo by Crisp Architects – Finish dinner and help the kids with their homework. Move this portable island near you when you need an extra surface, and push it to a corner of the kitchen when it gets a bit crowded. A rolling kitchen island can also be shoved to the side when you need to mop. But some homeowners might not like the impermanence of this island. Just make sure not to lean on it too hard or it could roll away. Photo by BlueWaterPictures- Dennis Anderson photographer – The most versatile kitchen island is the one that can move to any area of the kitchen. Stools are nice, but they’re not nearly as comfortable as a built-in banquette. A kitchen island with this kind of seating creates a cozy gathering spot for breakfast, and it can be used as a makeshift home office space when the kids are at school. 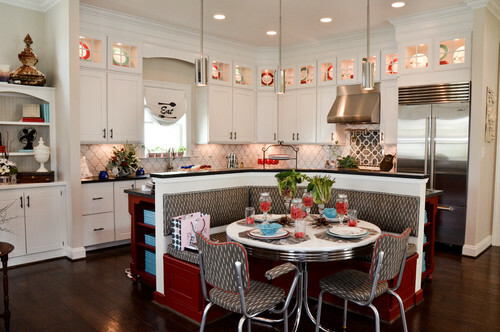 Photo by A. Dodson’s – Your kitchen will feel like a cozy corner of your favorite diner.